Merlin Entertainments represents some of the world’s most famous attraction brands, including The London Eye, Madam Tussauds, and the most famous UK seaside landmark, The Blackpool Tower. The Blackpool Tower is admired by over 17 million visitors to the resort each year and houses five exciting family attractions: The Tower Eye, The Blackpool Tower Ballroom, The Blackpool Tower Circus, Jungle Jim’s and The Blackpool Tower Dungeon. With such a broad offering across the five attractions, The Blackpool Tower website has to present a lot of information in an exciting and informative way. Doing so without losing the impact of the five unique brands or confusing customers presented a challenge that the old website no longer entirely fulfilled, with many ticket sales lost due to confusion or functionality issues. Soap was enlisted to develop a compelling user experience that would harness the excitement of planning a visit to The Blackpool Tower and drive ticket sales. Visiting an attraction’s website should be part of what builds that excitement for a day trip or holiday. Great imagery, appealing tone of voice, visual cues, and ways to plan a visit all contribute to that experience, but only if they work well for the user, who will soon lose faith and abandon a purchase if the website feels clunky or doesn’t appear to be in full working order. Through a combination of advanced programming capabilities and testing, we found ways to remove these obstacles and guarantee visits to the website are a successful user-friendly experience across all devices. An improvement in the time visitors spend on the site, page views and conversion rates is assured. Visiting an attraction’s website should be part of what builds that excitement for a day trip or holiday. Great imagery, appealing tone of voice, visual cues, and ways to plan a visit all contribute to that experience, but only if they work well for the user, who will soon lose faith and abandon a purchase if the website feels clunky or doesn't appear to be in full working order. While there is some overlap in the audiences that go to the five attractions, there are variations in demographic that have differing expectations from the website. We conducted a survey to gain greater insight into who exactly the various stakeholders of the project were and the likely requirements of each profile. From here we worked those requirements into an optimised site structure, with minimal copy and all the visual cues needed to ensure each of those profiles had a distinct user journey and that branding was clear and appealing. These carefully planned pathways provide the customer with all the information and reinforcement required to make a decision and convert their visit to ticket purchase. 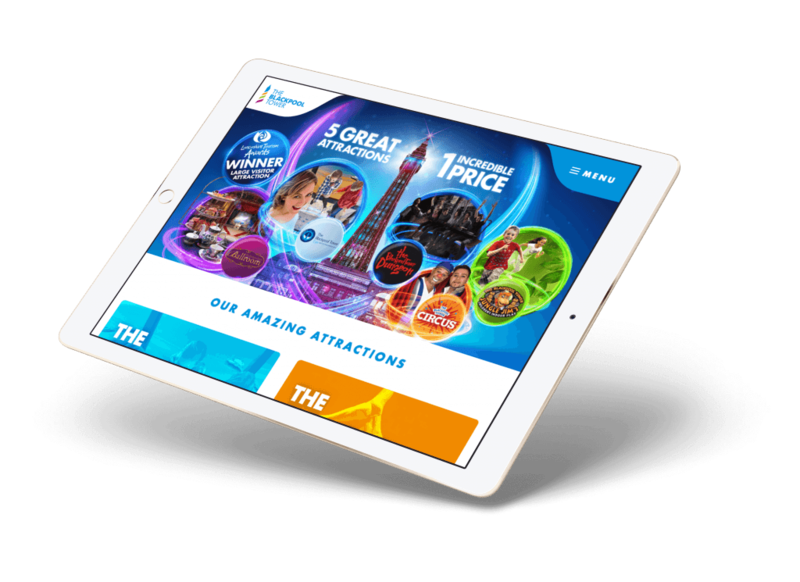 As a very large and hugely successful organisation, Merlin Entertainments had to be sure that the website would function well alongside existing websites for their other brands to a strict technical specification. This was not only vital for front-end development but for back-end administration too. Soap can facilitate all the custom elements and software integration required for the smooth-running of a brand, including vast international organisations such as Merlin Entertainment. Our developers are adept programmers in all languages, and they adapted to work with the platforms and frameworks required for this highly bespoke build. We integrated multiple third party management software solutions seamlessly with The Blackpool Tower website on a short lead-time. The result was improved performance all-round, with simpler administration of the website, advanced monitoring and a clear route to achieving targets. We built the website using Microsoft Azure Platform, enabling burstable, scalable performance so that the site could present the best customer experience and ultimately convert revenue. The subtle animations, transitions and interactions of the design, although small in isolation, collectively build a visual language that translates the excitement of the attractions and encourages customers along that journey to the doorstep of the attractions. The latest iteration of Umbraco was used which allowed us to develop an ‘any expertise’ CMS that allowed for any unique layout to be created visually and most importantly without any techie or html experience. This empowered the internal marketing team to rapidly respond to time sensitive promotions and communicate messages onsite easily and at speed. We integrated Experian Marketing Suite for email management and cross-channel marketing tracking. This creates a joined up, automated follow procedure to nurture a customer through an onboarding lifecycle all the way through to conversion and future value. In addition to the development of a visually striking and technically complex new website, Soap Media also provides The Blackpool Tower and its five attractions with social media content and planning support on an ongoing basis. This routine content is produced in advance, on an ongoing basis in order to support the busy marketing team. This cost-effective supply of engaging social content frees up experienced staff at Merlin Entertainments to focus on tasks that grow customer visits. The Blackpool Tower website is hosted on the Microsoft Azure platform, which ensures flawless performance of the website during peak traffic surges. Merlin Entertainments also benefits from the advanced analytics insights of this powerful solution, and support in harnessing this from Soap. Azure hosting is one of many data management services provided by Soap Media that aids flexibility and security for your brand on an international scale, while driving faster growth.